From “The Tudors” to “A Little Chaos” – Reduce, Reuse, Recycle? When Helen McCrory (as André Le Nôtre’s wife) first came on scene, Trystan and I had our mouths hanging open. Partially because we were laughing so hard. “WHAT is that?” we kept asking each other. I guess what I should have written down was “Anne of Cleves by way of Little India,” because yeah. 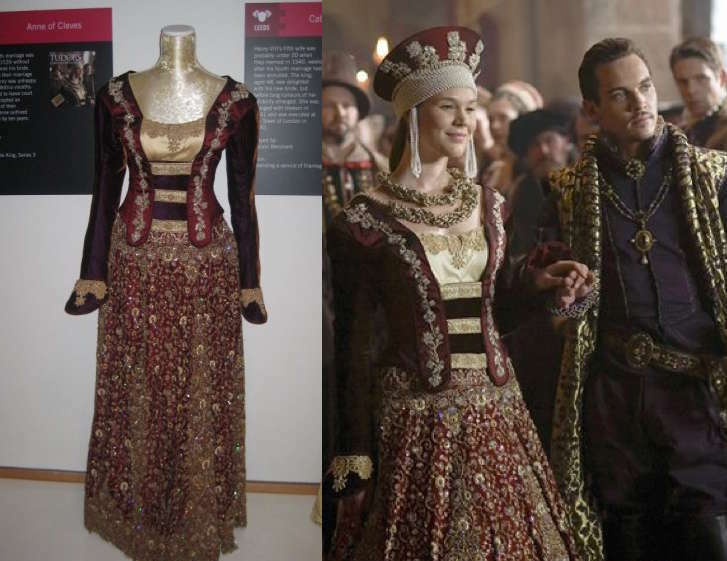 That ensemble was first worn by actress Joss Stone, playing Henry VIII’s fourth wife, in The Tudors. Where it is equally random. Looks like they swapped out the stomacher and called it good. Joss Stone as Anne of Cleves in The Tudors. I have no idea. Here’s a merchant’s wife in summer at-home wear. Nicolas Arnoult, “Femme de Marchand en deshabillé d’Esté,” Recueil des modes de la cour de France, 1687. LACMA. Or, since she does hang out at court a lot, maybe she should be dressed even better, like this woman of quality wearing a summer ensemble. Nicolas Arnoult, “Dame de qualité en habit d’Esté,” Recueil des modes de la cour de France, 1682-1683. LACMA. Instead, she’s in a lovely red, beaded Indian lehenga skirt and I-have-no-idea top. 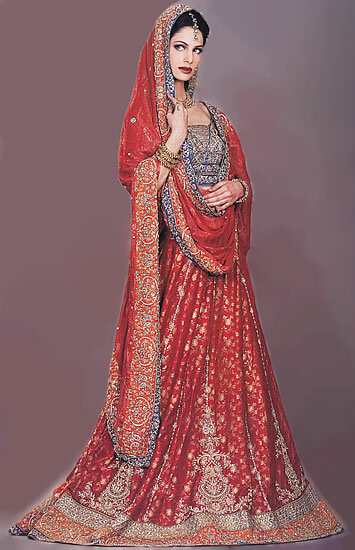 Modern Indian lehenga skirt with choli top and dupatta scarf. With bonus contrast back lacing! This is the dress that Trystan swore was embroidered with a dinosaur. Note open skirt in front and different fabric for the sleeves and skirt. “What the hell?” we said. Madame Le Nôtre, rocking the dinosaur. Silly us! We should have REALIZED that when they said Madame Le Nôtre, what they meant was Princess Mary Le Tudor! 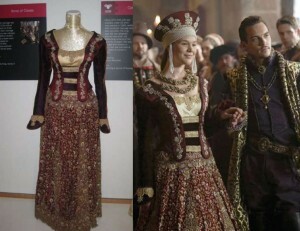 Yes, this is Sarah Bolger as Mary Tudor’s “peacock” dress (sadly, no dinosaur) from The Tudors. Without a hint of alteration or anything to try to make it 17th century. Princess Mary. This isn’t very Tudor-period-appropriate, either. The Princess Palatine, rocking the Johnny Rhys Meyers look. Nicolas Bonnart, “Dame en habit de chasse,” Recueil des modes de la cour de France, 1670. LACMA. 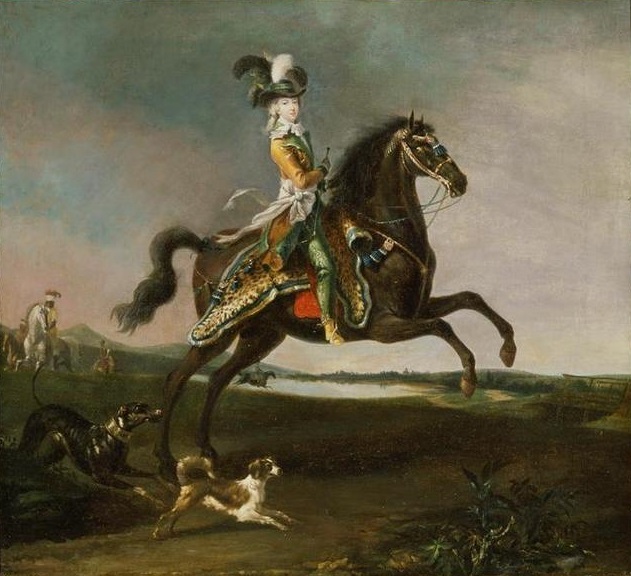 Antoine Trouvain, “Mademoiselle de Loube, Fille d’honneur de madame, en habit de Chasse,” c. 1692-95. Rijksmuseum. 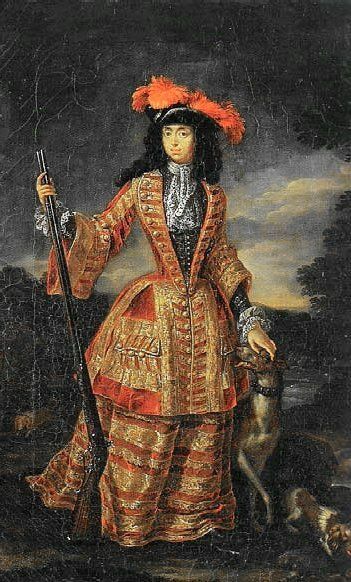 Jan Frans van Doeven, “Anna Maria Luisa de’ Medici in hunting dress,” c. 1695. Pitti Palace. 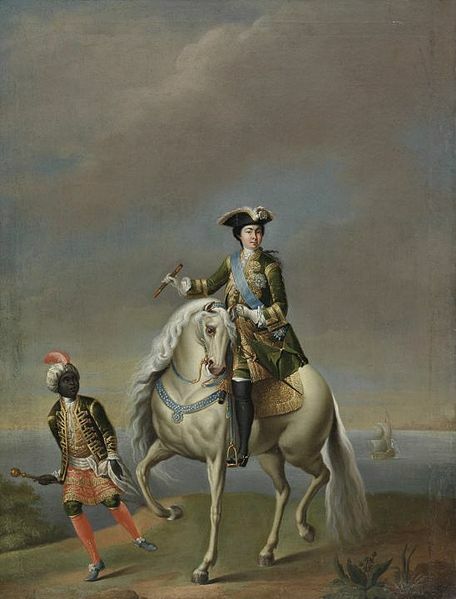 After Georg Christoph Grooth, “Equestrian portrait of Empress Catherine I (1684-1727),” mid-18th century. Kadrioru kunstimuuseum. Louis-Auguste Brun, “Portait équestre de la reine Marie-Antoinette,” 1783. Palace of Versailles. But I somehow doubt that IF this was done in the late 17th century, the woman in question would be wearing Elizabethan ham pants trunkhose (remind me to do a post about “ham pants” someday!). 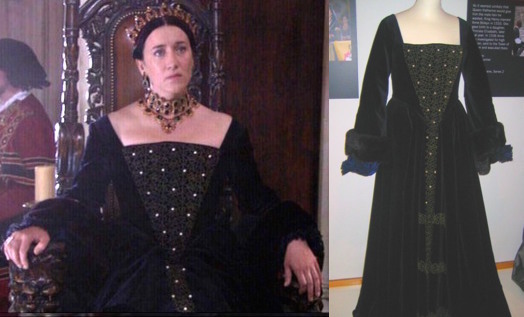 Maria Doyle Kennedy as Catherine of Aragon in The Tudors. The period was astonishingly camp, though I think camp is the wrong word. It was more the fact that these people lived together in court in their hundreds and the men tried to outdo each other as much as the women. They certainly did “run with it”! Reused costumes from The Tudors. Discuss! 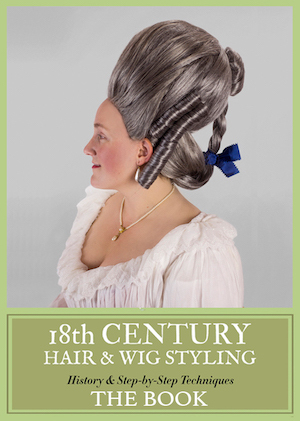 I recently watched this film and the whole time I kept thinking “wait, what century is this in?” and also “doesn’t the Princess Palatine have a royal hairdresser or something?!? Sad that it wasn’t a dinosaur! Not surprised that it’s just as inaccurate. Oh Joan, if you’d only pay attention to us bloggers instead of ‘running with it’ (which sounds like ‘running away from it,’ & “it” is historical accuracy). 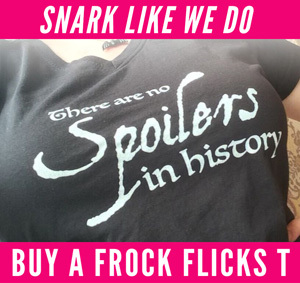 So… is the movie worth watching other than costumes? I mean Alan Rickman and Kate Winslet! On my own tangent after looking at these, how in the name of holy hell was a woman supposed to climb ON a horse, much less RIDE one, sidesaddle, no less, in one of the outfits in the historical plates?? my eyes….they bleed! Was the storyline at least good enough to merit a viewing? Nice storyline but slow build up in my opinion. I tried to watch it but had to abandon it ten minutes or so in, to go and take some antacids for my eyes. I stumbled on to this while searching info on “A little Chaos” Wow, you do realise this isn’t a history lesson??? considering the story is fictitious, it doesn’t surprise me that the costumes aren’t accurate. I’m glad Hollywood doesn’t listen to bloggers, creative people shouldn’t be so restrained! Do you really think that just because the story is fictitious the characters can be dressed willy- nilly in whatever falls out of the costumer’s closet?!? It is still set in a certain period!